Doc Paskowitz has a story unlike most conventional 10-year-olds. Not only does he carry the namesake of his famous grandfather, Dorian “Doc” Paskowitz, he’s also surfed and traveled around the world since he was born, and lived everywhere from the sands of San Clemente to remote islands in the South Pacific. The Paskowitz family is well-known for being “the first family of surfing,” as Dorian “Doc” Paskowitz, his wife and their nine children, including Doc’s father, Adam, started running the Paskowitz Surf Camps every summer in San Diego, Mexico and New York back in 1972. Doc is now following a similar path as his father Adam. Not only has he helped out with the Paskowitz Surf Camps for the past six or seven years, he travels from one destination to the next to surf, learn about the world around him. “One of the reasons we travel is to meet and understand local communities no matter where we are,” said Tracey Paskowitz, Doc’s mother. Tracey Paskowitz said the family is always trying to “give back,” not just with foundations like Surfer’s Healing, but by being active and helping where it’s needed most. Doc has lived and surfed in places like Tahiti, Fiji, Kiribati, New Zealand, Australia, the Cook Islands and British Columbia. Doc said some of his favorite places are the islands he lived on. “They have the same personality in a way, but they are all different,” Doc said, adding the best waves he surfed were in Tahiti and Canada, while San Onofre and San Diego remain his favorite local spots. In his most recent travels, Doc has visited some of the same cities his father also traveled to as a child. He said in South Dakota he almost rode a herd of buffalo, and one of his most memorable experiences was in Rarotonga, where he swam just feet away from 60-foot humpback whales. “It’s one of the most amazing things I’ve ever seen,” Doc said. When Doc grows up, he said he might want to take up where his great uncle, Mel Blanc, left off, playing the voices of Bugs Bunny characters, or become a professional skateboarder or surfer. “My dad was one of the best skateboarders of his time, and was one of the best surfers in the world behind Bill Hamilton and Mark Richards,” Doc said. Doc likes to study math, science, chemistry, oceans and music. Some of his hobbies include skateboarding, spear fishing, motocross and building mini robots. In the next few months, Doc will travel to the east coast with his family following the Surfer’s Healing Foundation. Then he will travel to Florida shortly after, where some of Doc’s best friends and family live. 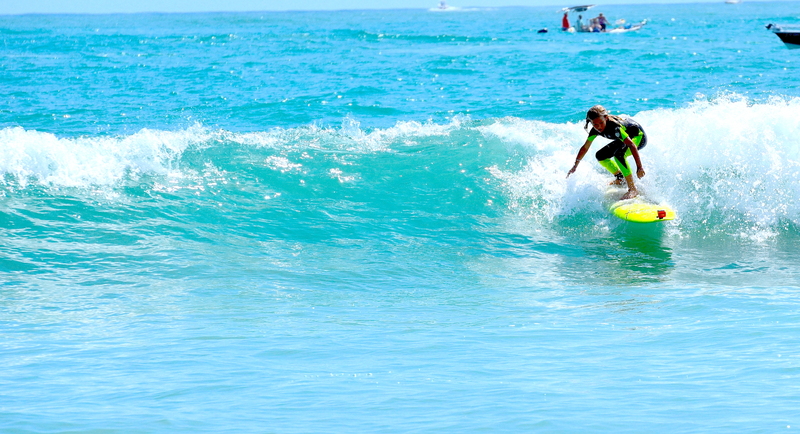 If you know a grom in Dana Point, San Clemente or San Juan Capistrano that we should feature in our Grom of the Week section, send a name and parent’s contact info to editor@danapointtimes.com.